I did this simple layout last night and worked to get it finished so I could post it today. I am not sure how something so simple takes so long to finish. Maybe it was the 30 minutes on hold with ProvoCraft, or the 4 hours on the phone with my BFF Karen, or stopping to make a grilled cheese, letting Lucy out to potty, cleaning the kitchen....I guess there are plenty of reasons now isn't there! I had given myself one of my famous haircuts *okie is just glad she didn't cut her finger this time like she did before* and I was trying to take a picture of it to send to a friend and Shiane came over and jumped into the frame. She is such a ham. There isn't enough pictures of my daughter and I together so I decided to scrap these instead of just delete them. I actually used a sketch from Sketches2Scrapbook for the basis of the layout. If you don't know what Sketch2Scrap is, it is an app for the Iphone. I downloaded the free version first and then ended up buying the full version for $4.99. It was worth every cent! 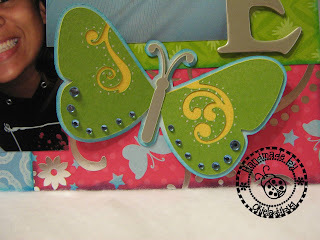 I thought about using the Cuttlebug on the butterflies but thought the patterns on the paper were so bold that the butterflies needed to be more simple. This is not one of my favorite layouts but when my daughter saw it she said "OMG! I love it! We look so much alike" and went on and on about it. 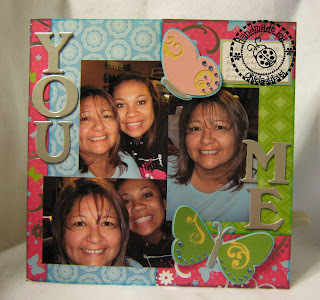 That is when I made another realization about scrapbooking...it isn't about making a work of art with each scrapbook page, it is about creating a memory that brings a smile to a face. Love the colors, embellies, etc.... and that it could make your daughter so WOW. 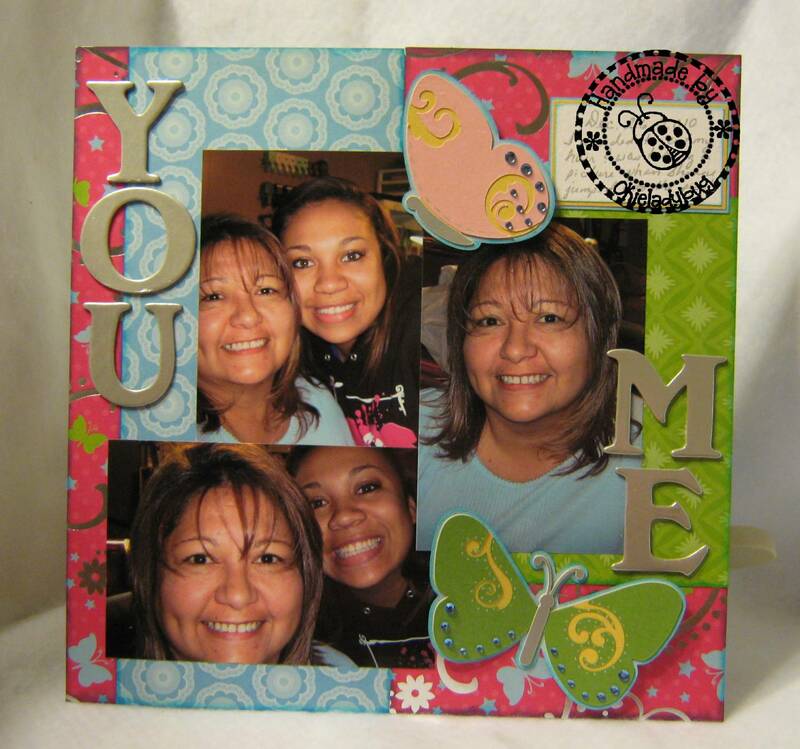 scrapbooking...it isn't about making a work of art with each scrapbook page, it is about creating a memory that brings a smile to a face. 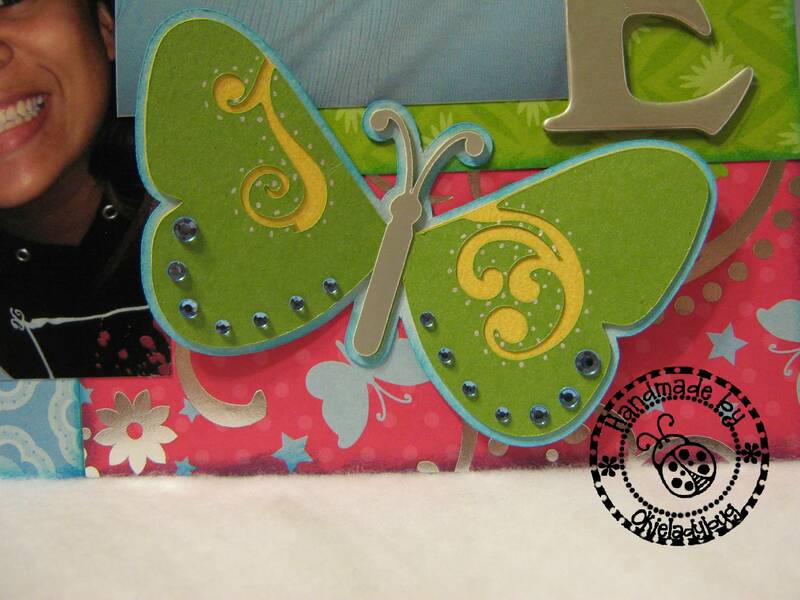 Even without it going through the cuttlebug, I think your butterfly is fantaboulous! And you are right... scrapping is about the memories - not the perfect page! very nice layout! well worth the time put into it! Love your layout. You two have the exact smile. Adorable. This is so sweet Okie!! I love the pictures and I think your layout is pretty too. You have a wonderful daughter!! And you are right. It is about making a memory accessible, not making artwork every time. Also, how do you pronounce Shiane? Is it like "Cheyenne" or "She-AHN" or something else entirely? Also my google account is acting weird, so I do the anonymous just to get the post to show up. Okie you are right. There are never enough pics of us and our kids together and I think I'm going to take one of me and my son when he gets home from school. I have a new camera and I need to start using it! Your cuts are always so amazing. Mine sometimes look like I took a chainsaw and freehanded some of mine and I have new blades! This is a beautiful and yes you and your daughter look just alike! Love the pictures. You are so good at making memories. I love the layout and the paper you used. This is a great LO! I agree about not everyone has to be a work of art, even though that is what I think too. I realize how important my scrapping is to my young adult sons when they started saving things and bringing them to me to scrap! This is a great layout ... just awesome ... and a good reminder that the 'little things' in life are important, too! A sweet story and memory...beautiful smiles...and a great page. I didn't think the page looked so simple. There is a lot there. At least Okie has her priorities right. If it makes someone happy then you did the right thing. Okie,your LO's have been great and this one is great too! I was just thinking about not having many pics of my mother growing up which got me thinking that there aren't many pics of myself. I am always taking the pics. I guess I need to change that. Beautiful .. and I like the layout too ! Ilove this layout! You are one talented woman! You and your daughter are beautiful! Great layout Okie. You and your daughter are beautiful!